wyrmrage razor | That Was an Accident! So, my guild leader wrote a book, and another one of my guildies illustrated the cover! He’s asked me to take a look at it and write about it to raise awareness. It’s hard to write something coherent and cohesive in the first place let alone something over a couple pages, so he deserves at least that! Here goes. This entry was posted in World of Warcraft and tagged guild, song of sinai, wyrmrage razor on March 27, 2014 by Prinnie Powah. When we first entered the area where we would fight Siegecrafter Blackfuse, I felt amazement because OMFG PIPES AND THINGS! At last, I had found something cooler than a big evil cavernous hole in the ground filled with fire and angrypants crazyass orcs! Because this was the first time I’d been in this fight, I automatically suffered a bad, bad debuff to my critical reasoning, spatial awareness and overall level of comprehension, mostly because I was too busy taking screenshots and freaking out about all the things. The raid had the good sense not to put me on the conveyor belt team (because belts move and stuff happens, duh), so all I had to deal with was the crap on the main floor. As a result, the fight seemed quick. Easy, even! Well, unless you count the lines. At one point, folks started to tell me not to stand inside the yellow lines, but I didn’t see any yellow lines to stand outside of. Nope, thanks to my color settings, I saw orange lines. Given the debuff mentioned above, it is probably no surprise that I thought orange lines CLEARLY could not be the yellow lines my teammates mentioned. No, there must be yellow–yellow lines that I’m not seeing! Must look for yellow lines, need to be on the lookout for yellow lines! 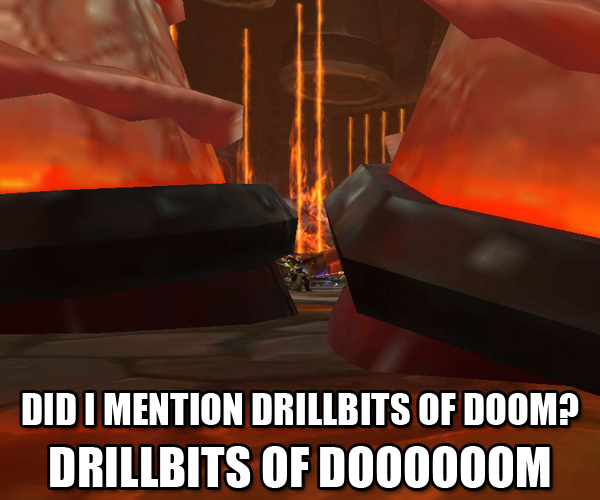 Turns out that they ARE the same (duh #2), and if you stand inside the lines, you’ll get machined into a million pieces by sixty billion drill bits from the depths of hell. Whoops! They’re numerous. They’re practically everywhere. And they kill you dead. Now go be “lucid” elsewhere, plzkthx. We’re fine, thanks. 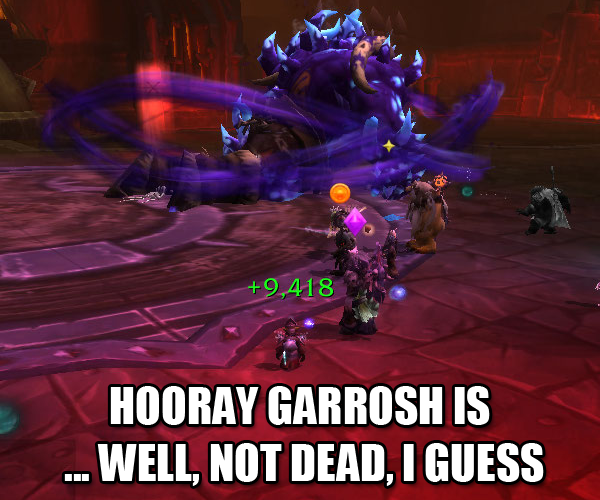 No no, you don’t have to go out of your way, Garrosh. A cut here for the people who care, since this is like, THE MEANING AND CLOSURE AND STUFF of the expac. This entry was posted in Bombelina, For the Horde, Baby!, Goblins, World of Warcraft and tagged /omg, bombelina (formerly electrika), death and destruction, flex raiding, garrosh hellscream, goblins, guild, maybe someday will be better, oh the goblinity, paragons of the klaxxi, siege of orgrimmar, siegecrafter blackfuse, that's probably not good, world of warcraft, wyrmrage razor on October 28, 2013 by Prinnie Powah. 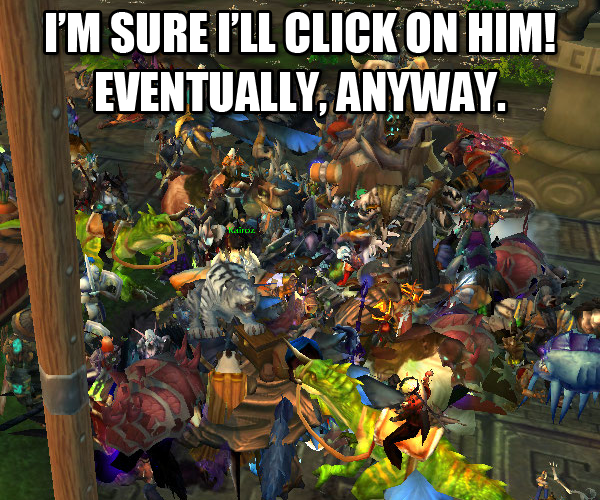 How Has Orgrimmar Not Caved In By Now? So there’s this lovely Ancient Miasma thing Malkorok’s got that prevents healing from actually restoring HP, and instead converts it into an absorb shield. This stuff has a taste reminiscent of asbestos and turns all healers into wannabe Disc priests, whether they actually wanna be or not. 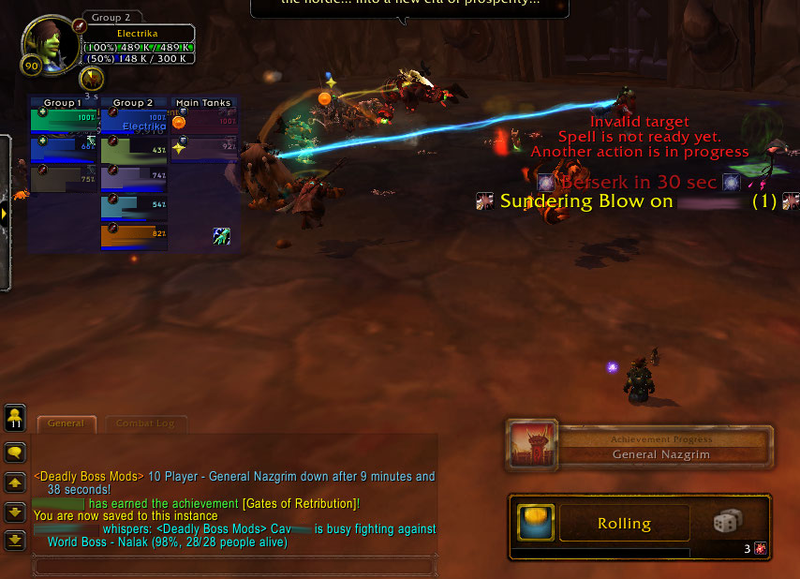 Ancient Miasma also renders me absolutely terrified of having to do something other than DPS down in the Underhold, because there’s no way what have I done to deserve this I don’t understand. I mean, what does Blizzard want from me? To think and heal at the same freaking time? I can’t multitask like that unless it’s panic and coffee! When we first dabbled in the fight on Normal mode, Ancient Miasma + ALL THE OTHER SHEEYIT HALP was like a cancer of instadeath. While I can’t say that we cured cancer or removed asbestos from the world in general, we did finally master the use of Ancient Miasma in Flex mode (well, mostly). Ancient Miasma builds a shield that has three levels of strength, indicated by a single buff/debuff square that’s up on your screen with all the rest of the damn squares you always have. (Why hasn’t DBM built in a magic sensor or summary box thingie yet?) Generally speaking, if your shield is on low and you try to soak one of the Imploding Energy purple swirlies or get caught in something else, it’s been nice knowing you. For me, at least, the most annoying thing was the Arcing Smash + Breath of Y’shaargh combo. Arcing Smash of course hurts like hell, but that’s not really the problem. No, the problem is that you have to remember what three sections of the symmetrical, circular platform have last been hit by Arcing Smash, because if you are standing there when Malkies uses the Breath of Y’shaat, you are effed. There is no indication of what area’s been affected, so you literally have to rely on your already overtaxed brain to keep track. 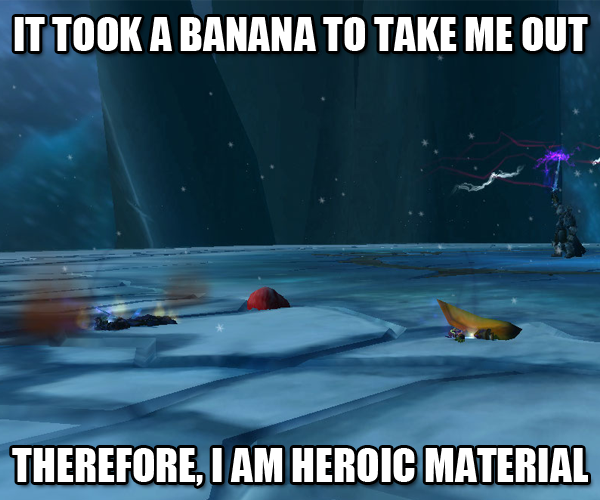 LFR IS DOOMED. DOOMED, I TELL YOU. I tried to tell you, but you just wouldn’t listen. There wouldn’t be enough room for this kinda thing anyway. It’s too late to regret it now! Sadly, it’s not a good idea to have DPS open whatever box seems coolest at that particular moment, which broke my poor little goblin heart. 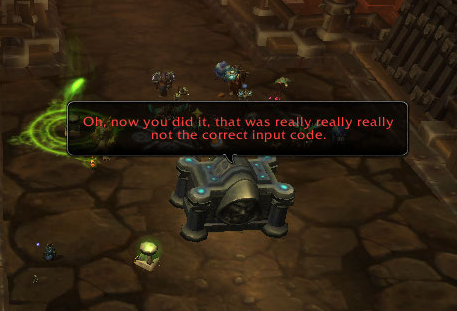 I don’t know if you’ve noticed, but Kor’kron have the weirdest problems with boxing crap up. Usually, you’d consider it a great idea to make sure whatever is DEAD before you stuff it in a crate, but nobody apparently thought of that here. 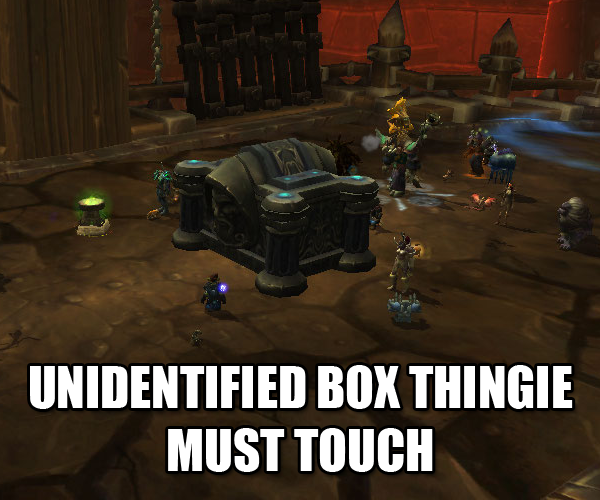 I do gotta say that this time, the Kor’kron habit of putting ONE THING per box actually works in our favor (unlike the stupid crashed resource caravans in the Barrens), since the things that are in the boxes are universally not dead enough until you kill them. I hate this encounter because of all the unopened boxes, sitting there within reach, constantly tempting me to click on them and wipe us all. “Open me,” they whisper. “There could be loot inside! Okay, probably not, but you like opening things, right?” I DO. I LOVE OPENING THINGS. And I love this encounter, because while I may not be allowed to open any of the boxes, this whole thing’s been engineered by my favorite race ever. So sheeyit be crazy! 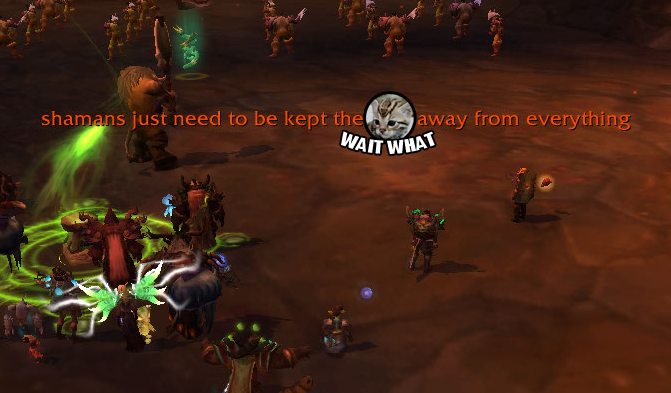 Yeah, you read that right – that particular instakill “Kills everyone, their friends, and distant family members in the immediate area.” So don’t bring your momma to raid, because when we goblins blow sheeyit up, we BLOW SHEEYIT UP. 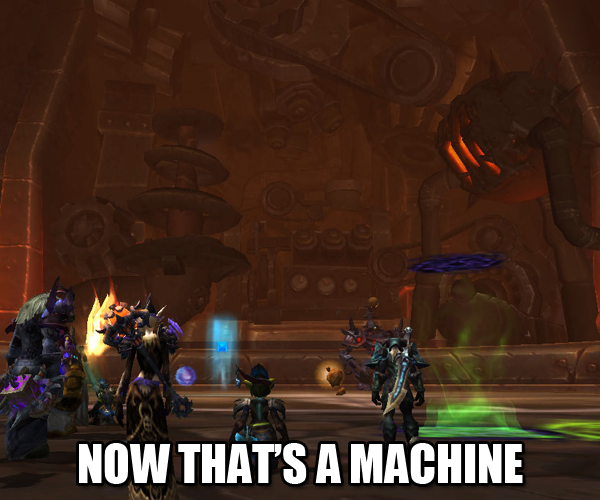 Mimiron’s Self-Destruct mechanism GOT NOTHIN’ compared to this. It also happens in like four minutes. HAHAHAHAHA. Haha. Heh. … sheeyit. 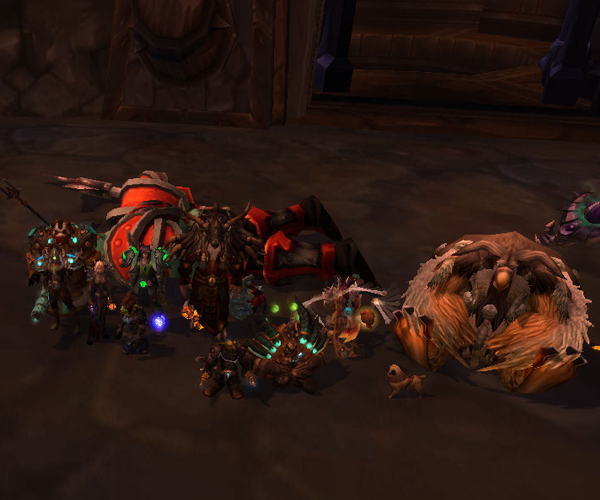 This entry was posted in Bombelina, For the Horde, Baby!, Goblins, OMGWTF, World of Warcraft and tagged /omg, bombelina (formerly electrika), death and destruction, flex raiding, goblins, guild, malkorok, maybe someday will be better, oh the goblinity, secured stockpile of pandaren spoils, siege of orgrimmar, that's probably not good, the underhold, world of warcraft, wyrmrage razor on October 2, 2013 by Prinnie Powah. 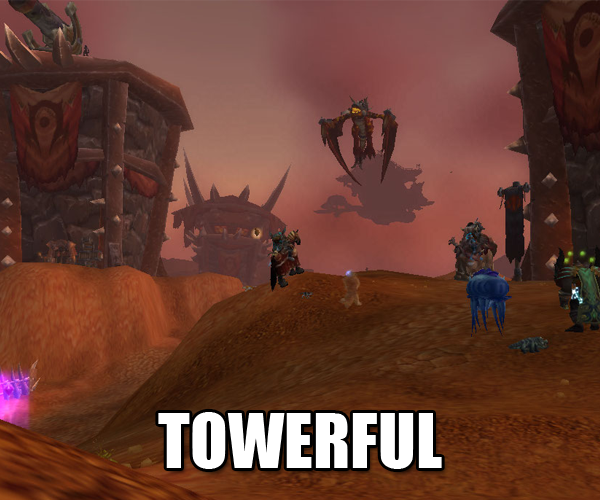 I admit it: I gave up on the Timeless Isle pretty fast. Actually, really fast. I would’ve given up on it even sooner if it hadn’t been for Cav, who insisted we kill some things and at least do some of the quests. It’s not a “I QUIT THIS FOREVER” sort of thing. As others have said, it’s a great way to gear alts, and Gawd knows I have a lot of them. It’s just that … there are problems. 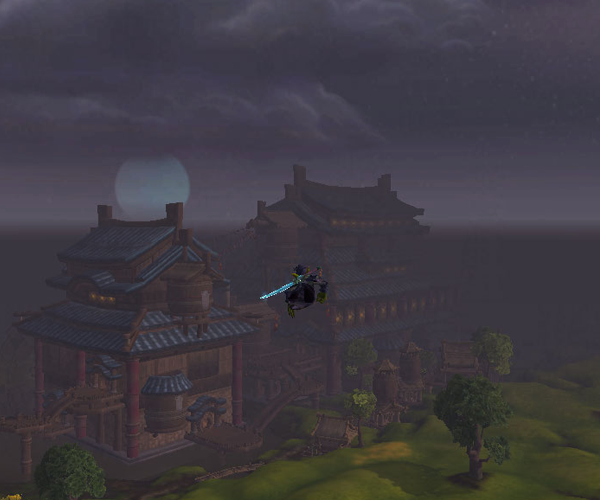 WRA is a high population realm, so what with the coalesced business and everybody and their mother being at the new Isle, I didn’t have a sense of “THIS IS AWESOME” so much as I had a feeling that was like, “holy crapbuckets, all the lag!” I had maybe 10 FPS at best. Elegon, is that you? 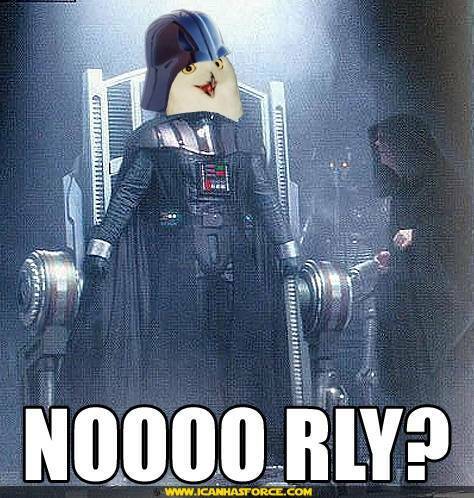 Oh wait, no, there aren’t any sparkly star people around. Since I could click on a flagged Alliance instead. Problem number two: sure, seeing others in an MMORPG makes you think that the game’s still alive … I guess. It’s just that, there’s practically nothing left alive on this island … oh wait, there’s a yaungol right there! Nobody’s tagged it! I’ll kill that! Well, that turned into “OH CRAP FIRE HELP OW BAD,” especially when three more yaungol spawned right there and aggroed on me. I guess that’s why the yaungol are still alive but hardly anything else is. Problem number four: I am also sick of specialized currencies and charms and crap, enough so that I’d shove my Timeless Coins in somebody’s eyeballs if I could. You want how many of these damned things again? Oh, I’ll give them to you, all right. IN THE FACE. So basically if I’m going to keep my sanity, I gotta wait until the place cools down and becomes less “OOOH SHINY NEW” to people. Or go there at like 6 a.m. 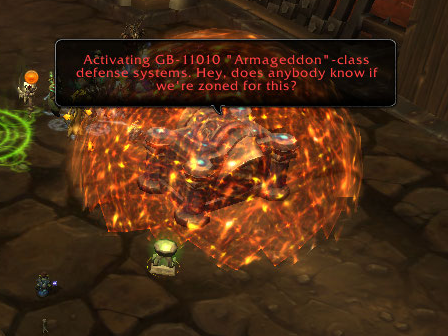 The guild started the flex raiding for funzies, and we pretty much facerolled the place until the third fight. 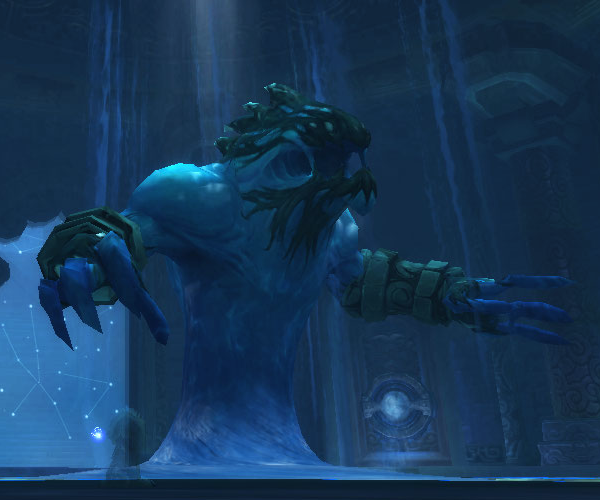 Immerseus: easy as hell on Flex, although probably a nightmare on normal mode. 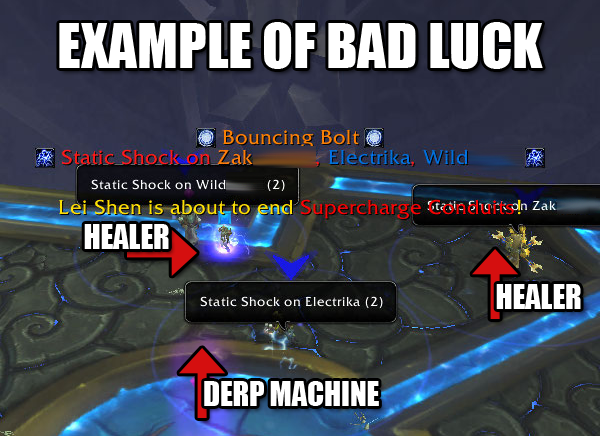 I really don’t like mechanics that force healers to heal NPCs (in this case, good, purified, innocent and happy blobs) in addition to their team. 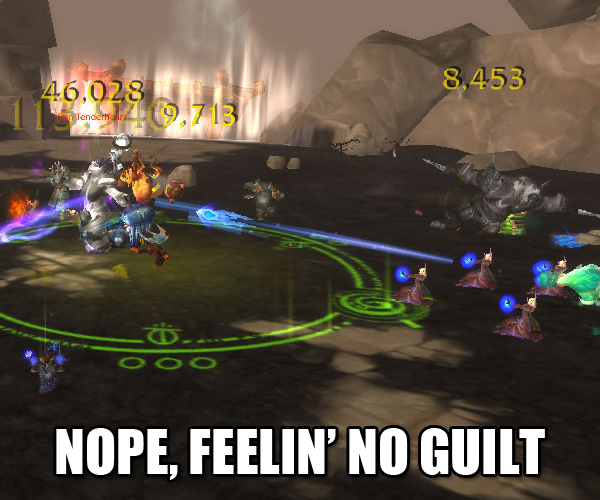 I feel like, what with the sheeyit-ton of damage a raid dishes out, healers got enough trouble to deal with without having to nurse some NPC back to full health. Give me more than 300k mana, and then maybe I’ll change my mind. All the sads, not feelin’ ’em. 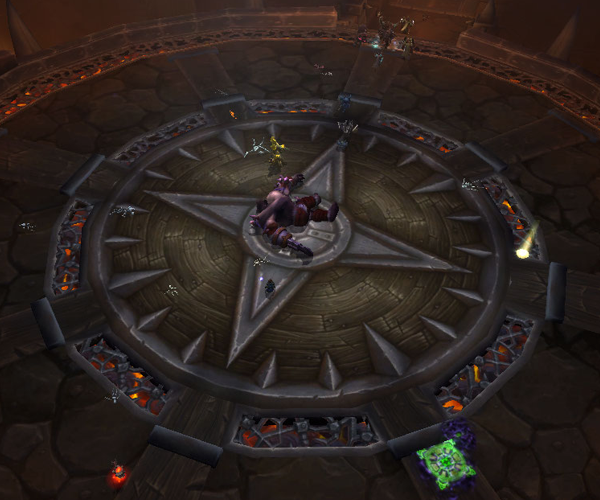 The Fallen Protectors: harder than Immerseus, but still not bad on Flex. 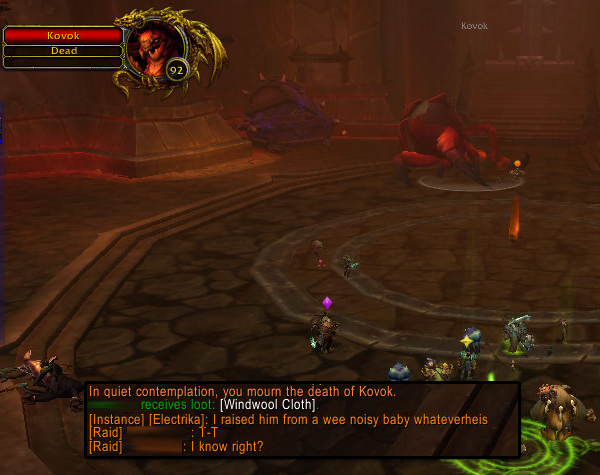 I dread this fight on LFR, because you really do need to coordinate targets based on their HP, and Gawd knows that LFR’s not really all that hot at coordinating. In any case, we wiped them all out uh, I mean, we released them from their suffering. Right. 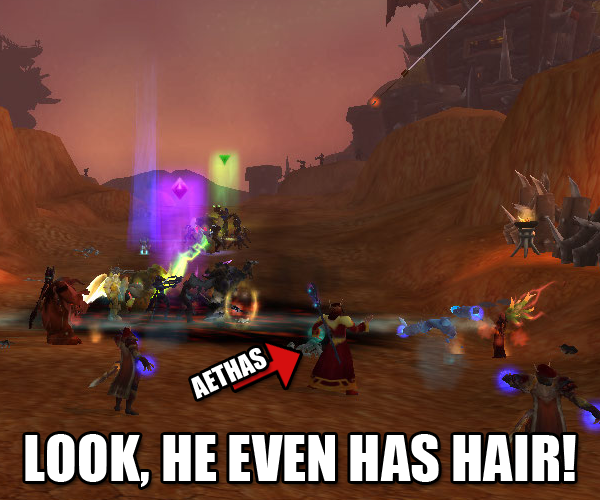 I know that I’m supposed to feel bad about what happened to the Golden Lotus. But I don’t. 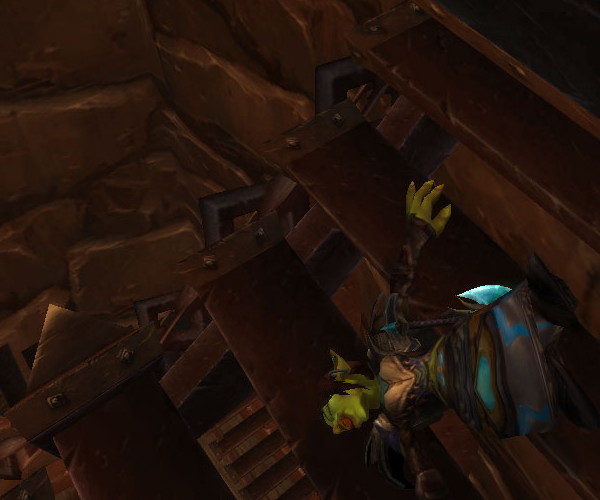 It’s possibly the goblin in me saying, “You had it coming” for all the times they tortured me. 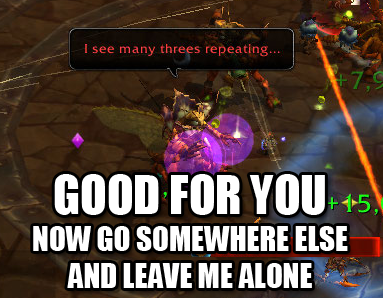 One of the things I like about this guild is that one of our raid leaders is British, so you get to hear him give commands/curse/whathaveyou in what is possibly the best accent ever. Getting told to target This Thing or That One becomes twice as awesome when it’s said in a British accent, trufax. Amalgam of Wait, What Just Happened? We were facerolling so well. Norushen Amalgam of Bad Things: Oh man, I do not look forward to this one on any mode ever. EVER. I really don’t know why they say you’re fighting Norushen here, as he just sticks you in a shiny box that he may or may not blow up if he determines that the Amalgam is Super Bad or something. You’re actually facing the Amalgam and the adds. You’ve gotta work out who soaks up the evil bad puddles of hurtiness, as well as who uses the shiny golden orbs to reduce their corruption. 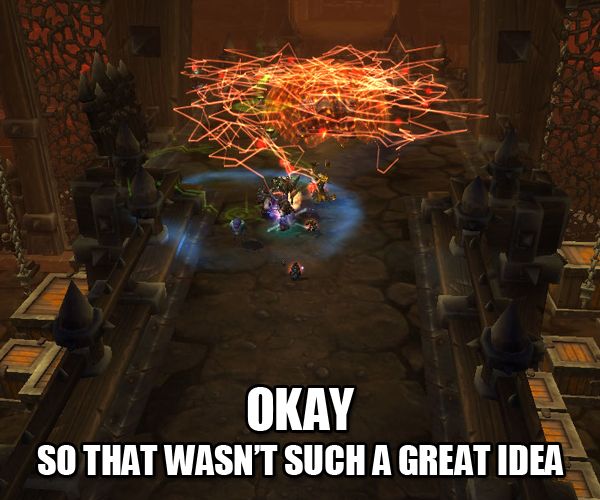 Reducing the corruption means you do more of whatever it is you do, as well as enabling healers/tanks to soak up said crap. We did get it down, but the fight was definitely a sudden stop to the facerolling party we had been having up to that point. That said, Flex raiding is pretty much the difficulty I imagine “normal” ought to be. But my standards are low and I like things easier than most, because I really don’t get what’s attractive about wiping 20+ times to any particular fight just because of one stroke of bad luck here or one bad choice there. I got a shiny ring, and I almost cackled with glee – until I remembered that I have like, 900 gold total after my LAST round of reforging/reenchanting/regemming. It’s time to make all the alts donate every last spare piece of gold, man. 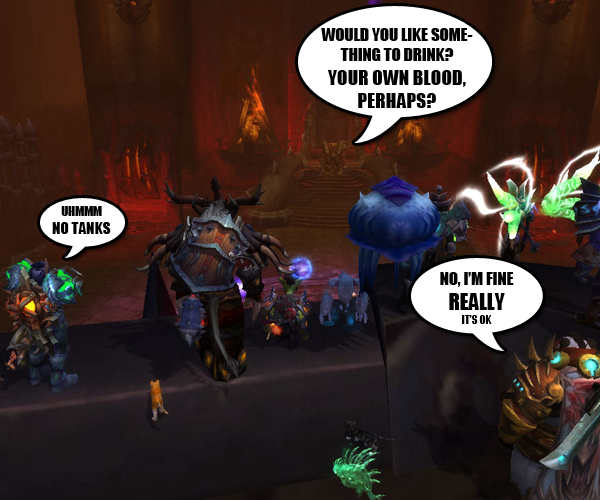 This entry was posted in Bombelina, For the Horde, Baby!, Goblins, World of Warcraft and tagged /omg, bombelina (formerly electrika), flex raiding, goblins, golden lotus, guild, immerseus, norushen, oh the goblinity, revenge is a dish best served with lava, seige of orgrimmar, the fallen protectors, timeless isle, world of warcraft, wyrmrage razor on September 11, 2013 by Prinnie Powah.